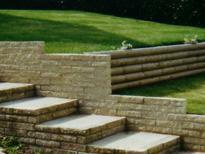 The choice of Walling and Edging products on the market has expanded rapidly over recent years. Although standard house bricks are still used for small walls, it is now quite common to see such walls built using more decorative bricks or blocks now available on the market. 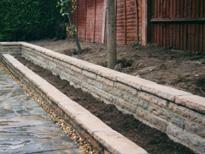 For example, Cotswold and Madoc Blocks are an increasingly popular choice for a retaining wall. Most bricks and blocks now come as part of a “patio set”, so that the same textures and colours can be used for the paving slabs and the surrounding wall. If your budget for a retaining wall doesn’t stretch to decorative bricks or blocks, then the use of timber is a cost effective alternative. 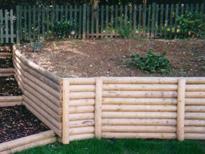 Sawn Railway Sleepers are popular as they give a neat and tidy effect to a retaining wall. They don’t cost as much as decorative blocks and they don’t take as long to build - so you save not only on the materials but also on the labour charge. Four inch Split Royals are another possible alternative. These are timber stakes that are split down the middle and then fixed horizontally to vertical posts set in concrete.